Duke probably doesn't drink cocktails, but if he did, this would be a good place to start. With Duke Nukem Forever tantalizingly close to release after more than a decade in development, what better way to celebrate than with a cocktail inspired by the man himself? 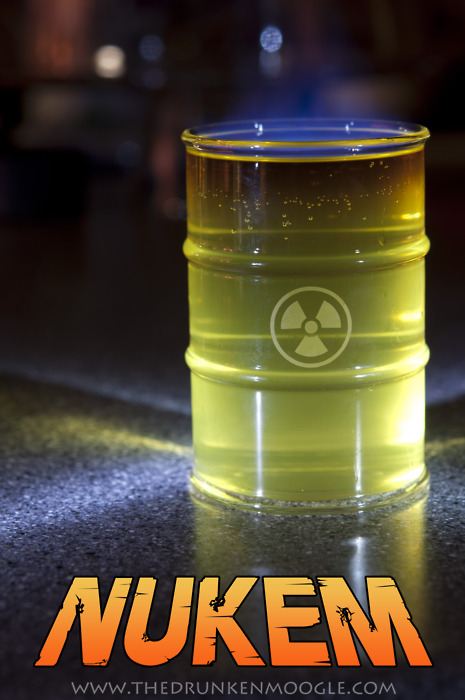 The folks over at the Drunken Moogle have created the "Nukem," a drink that combines high-strength booze and fire. The Nukem is a combination of rum, vodka, Mello Yello, and moonshine, which Drunken Moogle says is the clost thing to rocket fuel or nuclear waste that they could think of. However, if you can't get any moonshine, Drunken Moogle says that any suitably high-proof liquor will do. The first three ingredients are mixed together and poured into a glass, and then the moonshine - or whatever you happen to be using - is floated on the top and lit. Then it's simply a case of blowing out the flames and enjoying your drink. Honestly, Duke doesn't seem like much of a cocktail drinker to me, but if he did, he'd probably like the Nukem. Aside from being named after him, it's green and it's on fire; how could he possibly resist? You can find the full recipe on the Drunken Moogle website, along with dozens more videogame and otherwise geek-themed beverages. Duke Nukem Forever comes out for PC, PS3, and Xbox 360 on June 14th.